We wanted to bring to our viewers a really fun list to consider. Sometimes on the golf course, all you need is some fun tunes to get the party started. Sometimes all you want is a fun game of golf with your buddies and some music in the background. Well, if your golf course has no surround sound music around the course, then sometimes it is time to bring your own. With that, we wanted to come up with the list of the top ten best Bluetooth speakers for our audience. If you want a quality Bluetooth speaker that is designed to last and designed to be durable, check out the top ten best that we are eager to share with you. When creating this list our priorities were both quality and design and of course, the sound. Without further ado, let’s dive in! If you are wanting a quality speaking for the golf course or an easy at-home speaker for your backyard games of put-put, this is the product to get. The Cambridge Soundworks OontZ Angle 3 Speaker has many different strong points that make it an excellent product to consider. It has many features and a simple and easy to use functionality design. Here is the first quality feature of this product. First, this product is very high quality and it actually comes in four colors. An individual can select between blue, black, red, and white. Overall, the colors are designed to be anti-fade and scratch-resistant in the case that you want to travel with it. However, it is the fact that the case is weatherproof and water resistant that makes it a great product for the course. If you want to travel around your golf cart with a bit of music and it starts to rain you don’t need to worry. This product is designed with a rechargeable battery that allows for an individual to easily be able to use the product for long periods at a time. You can either use the speaker while it is plugged in or you can use it after it is fully charged. It can last up to a total of twelve hours and has a very long range Bluetooth, 100 feet to be exact. Therefore, individuals can enjoy a game of put-put or golf and the speaker does not need to be next to your phone. As far as the price, this speaker is actually very affordable. It is currently discounted and going fast, but users have also touted it for its marvelous sound quality and durability. This product has about 30k really positive reviews and it is almost rated a five-star speaker. Overall, this product is designed to give individuals long-lasting music and plenty of sound and bass. Water resistant and rainproof design. Rich bass and passive bass radiator design. Separate grill for passive bass. May take a while to charge fully. May randomly disconnect from Bluetooth. If you want a superior sound quality from a brand that focuses on quality, design, and appeal, this is it. 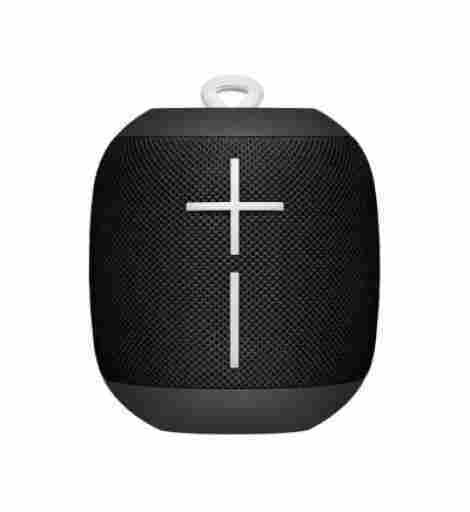 This is the Doss Touch Wireless Bluetooth Speaker and it is a quality product that is designed to be durable and for individuals that want to travel with a simple portable speaker. Whether you want smooth jazz on the golf course or a great and upbeat song, this speaker is excellent as far as sound clarity and quality. This product comes with the latest Bluetooth technology, which allows the design to be very high quality and easy to use. For instance, the speaker itself automatically reconnects to the last device used so you do not need to keep connecting. It also has a 12-hour run time and it can easily be connected to any device. Overall, an individual can leave it on the golf cart, enjoy a couple of rounds on the course, and also be able to enjoy a couple oldies. This item is not only equipped with the latest technology as far as the core of the product, but it also has a sensitive touch at the top. The laser carving finish with the light-up keys makes the overall design a very high quality and modern design. The simple touch system is a blend of elegance and modern appeal. An individual can skip music at their leisure and also be able to answer phone calls as they wish. Adjust the volume with the ring may be the coolest feature. For the price, you get more modern amenities for this product compared to other speakers in the industry. To add to this, the design is simple, durable, and it comes with magnificent sound quality. It is not as water-resistant as other speakers, but it is a bit smaller and more portable, making it easy to carry with one hand. For the price, there are five colors to choose from and an overall design that is modern and cool. Quality portable Bluetooth speaker design. Comes with latest Bluetooth technology. No wall outlet plug, only USB. It is time to talk about a brand that has long been known in the tech industry for producing many of the best modern-day speakers. This brand knows a lot when it comes to quality products and they excel at creating quality and design into one simple package. 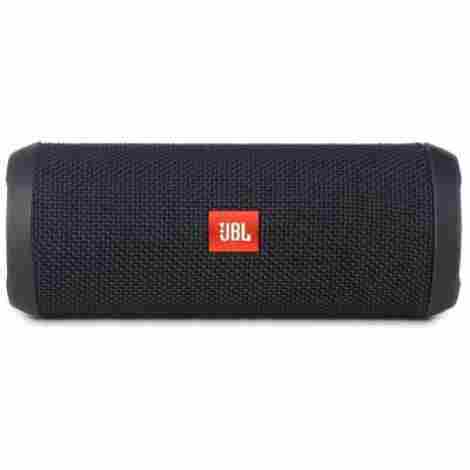 This is the JBL Flip 3 Splashproof Portable Speaker and we want to discuss and share what makes this product a bit more durable and high quality than most. This product is made with a very unique construction quality. First, the design is made like a tube, so it is easy to hold, carry, and even fit in your pocket if you have cargo pants. To add to this, the construction is among one of the most durable products in the industry. For instance, the design is made of a durable fabric interior alongside a rugged rubber housing and trim that makes the product virtually indestructible. Unless you run it over with a golf cart, this item will last. As far as technical features, this product has plenty of them. First, it has a quality wireless Bluetooth connectivity that allows for an individual to connect three separate electronic devices such as a tablet or cellphone. Alongside this, the speaker is so powerful that it fills the room. Overall, the 3000 mAH rechargeable battery is incredibly high quality and able to reach ten hours of playtime. It easily connects to your device and lastly, it even takes crystal clear phone calls at the touch of a button. To discuss the cost and the value, this product is considered a luxury portable speaker. Users will enjoy the overall design, the quality, the efficiency and the benefit of the design of this product alongside the longevity. More so, this brand has an excellent customer service team and it even comes with a warranty. Choose from their large selection of bright colors and you are guaranteed a product that is designed to last. Durable design with rubber casing. Allows for a user to answer phone calls. Older versions may have battery problems. 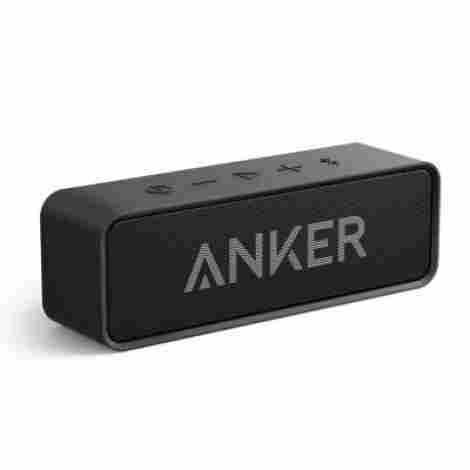 As product number four, the Anker brand has built a career of making virtually indestructible products. To add to this, the design of this product is incredibly high quality, durable, and designed to last. The Soundcore Bluetooth Speaker has a rich sound, quality bass, long Bluetooth range, and it is the perfect gift for the party golfer that wants a strong sound while riding around. If you are considering speakers, here are two reasons why this one should make it onto your Christmas list. We have discussed ten- and twelve-hour battery life speakers. However, this brand touts that this product has a 24-hour battery life. With that, they long-life battery technology is designed to ensure quality music for the full twenty-four hours. Unless you are going to go on a golf binge and golf for that long, we are sure you can get plenty of rounds of golf in without ever having to charge this product. 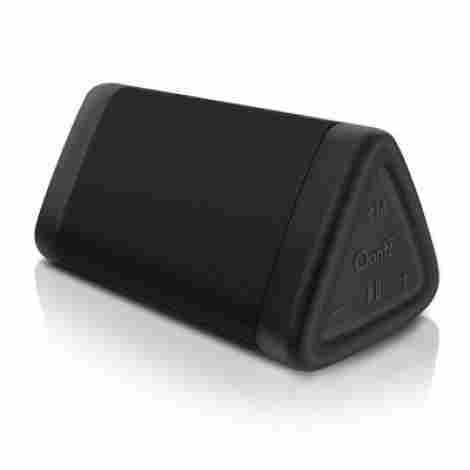 This product produces an incredibly powerful and beneficial sound. With that, they have an incredibly lightweight design that is intended to make it easy to carry and highly portable. With a built-in mic and many other features, there are plenty of positive reasons as to why an individual should consider this speaker. Overall, the is not as modern, but it is very high tech and strong as far as bass and sound. This item is priced to be very affordable. Although it does not have the indestructible characteristics of many other brands, it is a high-quality full range speaker with great Bluetooth connectivity and quality sound. It can easily be connected to cell phones and tablets and overall, the product is designed as a quality product to consider. With that, an individual can select three quality color choices. Quality sound and durable design. Effortless design and easy to carry. Connects and pairs easily to any device. Drop-proof build and seamless controls. Lightweight and very high-quality exterior shell. Not as much bass as other speakers. This next product is a highly durable and modern speaker that is built for outdoor environments. You can take it to the golf course during snowy weather, extreme heat, or heavy rain and nothing will happen to it. This speaker may be one of the most durable and also strong speakers in the industry. 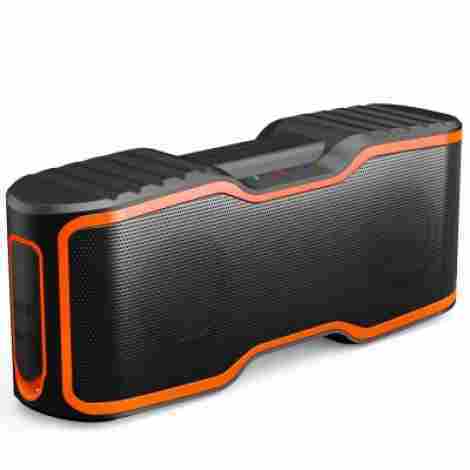 This is the Aomais Sport II Portable Wireless Speaker and it is designed with plenty of great features to consider. This product is made of a highly durable and robust casing that blends many of the highest quality tactical materials together. For instance, this product is made with a weather resistant IPX7 casing that enables the device to be fully functioning in all weather environments. In fact, it can even play submerged in water for up to thirty minutes. Don’t try it! If you want variety as far as being able to connect your device, this product has it. 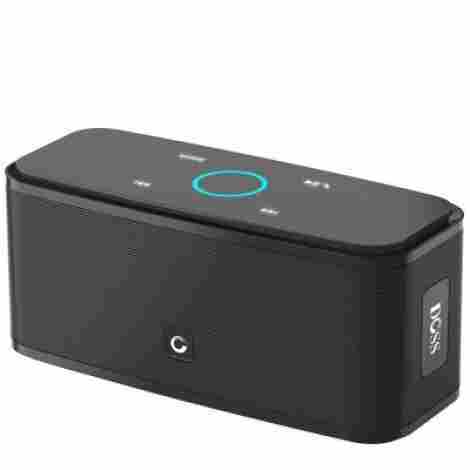 This product has a 3.5 mm aux input alongside high-quality Bluetooth that guarantees an individual will be able to connect their music easily. In fact, a user can connect their device and have a long range of distance to be able to play music. Overall, the design is a high-quality design that is intended to last. In discussing the cost and the value, it is important to acknowledge the many design benefits of this product. What is most shocking is the price, making it the most affordable speaker on our list so far with plenty of the same benefits as other speakers. Now, it actually has above 10k reviews and close to 4.5 stars for the design. With this in mind, we recommend this product if you want portability and quality in one simple package. 20w crisp sound with quality bass. Stands up to water and snow easily. Easy stereo pairing for quality surround sound. The mid-tones tend to crack. The next speaker we want our readers to consider is a quality and affordable speaker with strong sound, bass, and a 24-hour playtime. The Tribit XSound is headed towards the top by competing with some of the best and many touted brands out there. With a quality design, durable casing, and a quality interior tech build, there are two reasons why this product is highly touted and high quality. Now, this is the first speaker on our list where we have discussed one of the highest and most desired features in all of the tech industry, smart home grouping. This product has a smart-home grouping feature where you can easily connect the design to the Echo or any Alexa product in your home. Therefore, all you have to do is use your Alexa device to change your music and never have to touch your speaker or your cell phone. The coating of this product is a highly durable exterior coating allows the speaker to be dustproof and waterproof. To add to this, the design is very high quality, convenient, and it is designed with a slew of features that allow it to work under many conditions. It also is scratch and drop resistant, making it the perfect golf cart speaker to travel with. If it falls out of the cart, you have no need to worry about the casing or the design. As far as the price and quality for this speaker, the user can expect the design to be durable, high quality, and come with plenty of excellent features to consider. With a 66 foot radius and 24-hour playtime, this is the speaker to get if you want quality and durability in one simple package. Overall, the design is convenient and the power is made for a fun day on the course. Waterproof bass and speaker design. Connects to your Alexa easily. The bass is not as strong as other speakers. This next speaker is an extreme price difference from many of the brands we have shared. Sony has long been known for being the industry leader as far as electronics. Everything they produce from game systems to TV’s is exceptionally well done. With this, we want to discuss what makes this particular portable speaker a high-quality product worth considering if you want quality and durability in a simple package. This particular speaker not only has a phenomenal bass and sound system that ensures maximum quality as far as sound distribution and durability. The quality of the sound is a 3D immersive sound experience that ensures masterful auditory listening. To add to this, the sound adjusts to each individual song, creating a different and quality experience. This is an incredibly appealing speaker. Not only is it compact and beautiful mastered, but it also has a quality multicolored line light design that changes and strobes according to the bass and music of the song. To add to this, the light is just incredibly appealing. To add to this, with the light it can last up to 24 hours of use and the charging qualities of the speaker itself are incredibly simple and easy. The cost and value for this product is relative depending on the size and style of the item you get. In fact, this brand sells three different versions of the same speaker, that range in size and features. Overall, an individual can then choose different colors as well according to each speaker. The size will determine the strength, the quality, and the features. For the price, however, you are opting in for a premium quality product. Extreme bass and quality 3D sound. Connects to numerous speaker systems. Listen for up to 24 hours. Not every speaker is the same. May scratch at very high volumes. As the second speaker on our list from this brand, think of this product as the updated version of the last speaker we discussed from this manufacturer. 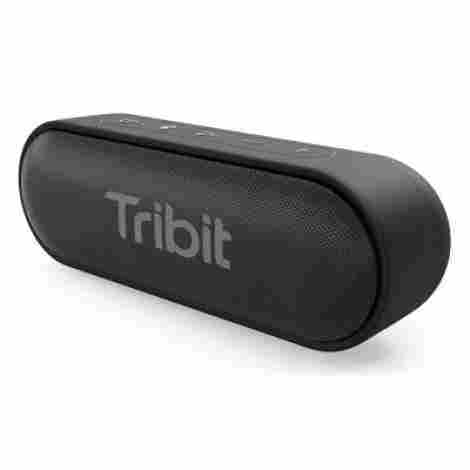 From the masterminds of Tribit, we are eager to share their 24W portable speaker with full surround sound audio. This one is everything we love about the first one we discussed but enhanced. Here is the first quality feature of this upgraded product. If you are eager for true immersive sound quality, this is the product to get. The 360 degrees immersive sound experience is like nothing you have ever heard from such a small and portable speaker before. It has crisp treble, resonating bass, and detailed voice and midtone volume that is intended to sound clear and crisp. With that, users will not get much of that shaky audio that sometimes occurs in portable and small speakers. Considering that this is an upgraded and updated product, we only expect the best as far as design and appeal. Therefore, we have to share that this product is simple, high quality, and intended to last. Overall, what is the best benefit is the fact that it comes with a waterproof casing and highly durable IPX7 design that ensures maximum support, durability, and quality during use. This product is costlier than many other speakers on our list, making it the second most costly behind Sony. The reason being is because this is a high end and high-quality product with plenty of design benefits and appeal. Most importantly, it is designed to last and designed to offer a wide range of luxury benefits. 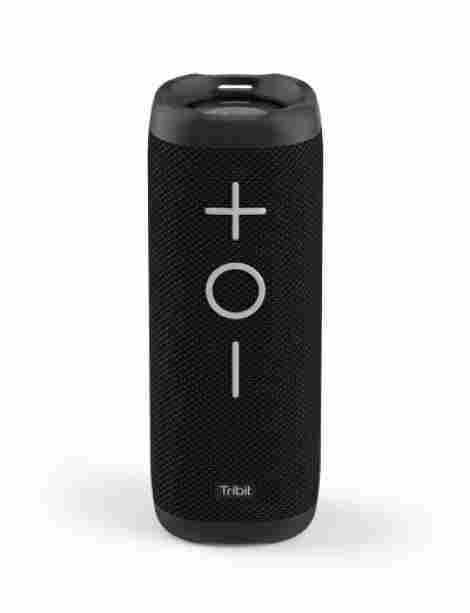 The brand has a 4.5 star to 5-star average rating and this product is touted as their ultimate portable speaker. Quality product that is durable. Wireless speaker with a 20-hour playtime. Surround sound experience is very high quality. Easy to use and easy to connect. One of the more expensive products. High volumes may cause speaker to shake. If you are wanting an expert machine that is high quality, simple and happens to be a fun pocket speaker, we have found the product for you. The Ultimate Ears WonderBoom is an expression of simplicity and quality in one simple product design. With a ten-hour battery life, this product is compact, tiny, weighs almost nothing, and comes in a large selection of fun colors and patterns. Let’s discuss what makes this product a great portable speaker system. This particular speaker comes with a 360-degree sound system. The sound system is intended to provide impressive audio and quality. Overall, the system is designed for individuals to enjoy it at a party, on a golf cart, or a fun gathering with friends. The sound has a great bass and quality adjustability to make it easy to hear your perfect songs at the perfect volume. The size of this speaker is designed to be incredibly compact. The overall design is simple, high quality and durable. However, it is the fact that it can fit in your pocket and in the palm of your hand makes it incredibly easy to use, carry, and pack. Simply place it in your golf stand bag and let it play music as you golf. It is so small it even has a key change for easy carry. To discuss the cost and value, individuals have discovered that this product is very high quality and comes in a variety of color choices. However, it currently is only being sold by specific sellers and the price will vary. This powerful little speaker has 1.1k reviews and an average of 4.5 stars. With that said, the user will discover that the design is incredibly effective and designed to last. Loud sound from small device. We have come to the last product on our list of the top ten best portable speakers and this product is the least and expensive and still has an average of 4.5 stars and plenty of happy customers. 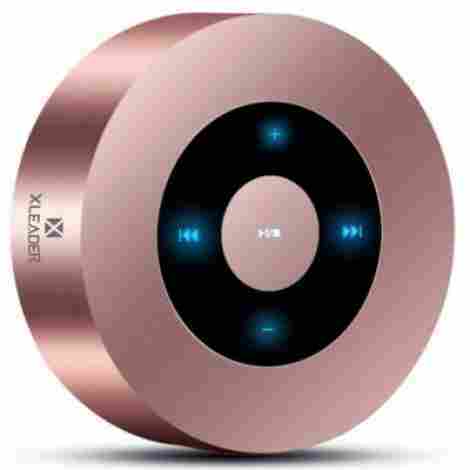 This is the Xleader Bluetooth Speaker and it is simple, easy to use, and durable. Here are two features to consider if you want an excellent and quality machine. This product has a rechargeable lithium battery that allows for up to 12 hours of music. Of course, if you use it at full volume it may be less, but overall it can last ten to twelve hours. With that, it easily recharges in 2-3 hours for fast use. It does not come with a wall plug but an individual can use a micro USB cable for easy and fast charging. The design of this product is easily compatible with many other products such as smartphones, tablets, and laptops, allowing for an individual to use it easily via the Bluetooth system. Also, you can insert a micro SD card or AUX cable and use it that way. This makes the product an efficient and high-quality machine for all individuals to use and enjoy. The cost and the benefits for this product is the fact that it has many of the same features as other compact and portable machines while being incredibly simple and high quality to use. To add to this, the design is durable, compact, and also comes in a variety of color choices to choose from. If you want quality and value in a simple package, we highly recommend this durable machine. Excellent design with touch screen technology. Compatible with many different devices. Not good for phone calls. So, are you ready to jam out? All of these products are designed by brands that focus on quality and durability. More so, many of the products we have shared are designed from expert leading brands in the technology industry that have a history of quality and a long range of products to consider. Therefore, we can confidently say that any of the speakers above you will be highly pleased with. However, what if you do not know what speaker to get? Well, we want to share with you the criteria for selecting the best Bluetooth speakers. This criterion is designed to help our audience define what are the most important factors to consider when purchasing one of these products. It would not be a portable speaker without it being small right? Well, we shared a wide variety of speakers but they all had one thing in common – they are able to be held with one hand. With that, a portable speaker is all about the size, compact design, and the overall sound quality. So, when considering a portable speaker for the golf course, consider the size of the product and exactly how you will be carrying it. Will it be on your golf cart? Are you storing it in the golf bag? This is a very important factor to consider. It would not be a portable speaker without it being durable and wear and tear resistant, right? Well, this is certainly true! No individual will feel comfortable enough to carry around a music speaker unless it had the qualities of it being highly durable. Well, what we encountered during our research is that almost all Bluetooth speakers are designed of highly durable materials that are designed for wear and tear. For instance, the most common materials are rubber, nylon, and other wear and tear tactical equipment materials that are designed to be incredibly durable. However, it is the slew of features as far as exterior qualities that make a product highly durable. For instance, many of the speakers are designed to be dust resistant, water-resistant, and can even be submerged for a period of time and still play music. With that in mind, when considering the durability, it is vital to consider the material of the product. This next criterion is an important factor because it relates to the type of technology that you want. All portable speakers have somewhat of the same outer shell; durable, portable, sleek, minimal. However, they all have many different features and internal components to consider. Therefore, it is important to consider what type of technology you desire. Some have 4.0 Bluetooth and others have 4.2. With that, here is a list of many common features to consider when selecting a speaker based on technology. Does it have loud performance bass or low bass? Is the sound surround sound? Does the product connect to smart home devices? Can you connect multiple devices to it? As the last criteria, one important aspect to consider is the warranty. The reason being is that a portable speaker will encounter much more wear and tear than a regular speaker. Therefore, when purchasing your specific product consider what kind of warranty it comes with. Many brands will offer a limited warranty or limited time warranty that only covers for a certain amount of time. With that, also the cost and value will determine the warranty and level of quality service from the brand. For instance, brands such as Sony cost a bit more compared to unknown brands due to their experience in the field and the overall quality of their products. Q: How long can the speaker be submerged for? A: Most commonly, many of the speakers that can be submerged can only be under water for about one meter and for about thirty minutes or so. With that, it is important to consider that this is only an estimate. Q: Does the speaker have any belt loops or attachment belts? A: Only one of the speakers we shared have an attachment loop for easy carry. With that, many brands have cases for their speakers and some are designed to make it easy to carry or have a carbine clip to make it easy to attach to something. Q: Is the speaker small enough to fit in a golf bag? A: Many speakers are designed for the purpose of fitting inside a personal bag. So yes, individuals can expect that the portable speakers we shared are designed to fit inside of a golf bag. Q: What makes the product so durable? A: Many of the speakers are made with a nylon material and rubber exterior or high-quality plastic exterior with a water-resistant coating that is designed to make the product highly durable and virtually indestructible.